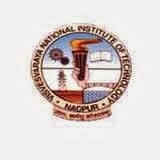 About Company: Visvesvaraya National Institute of Technology, Nagpur is one of the thirty National Institutes of Technology in the country. The Govt. of India conferred on the Institute, the Deemed to be University status (under University Grants Commission Act, 1956 (3 of 1956)) with effect from 26th June 2002.